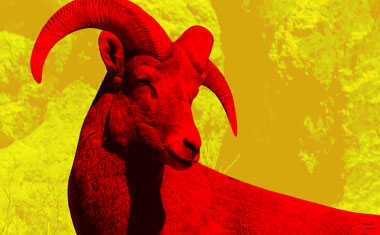 Ruled by action planet Mars, Aries is represented by the Ram. 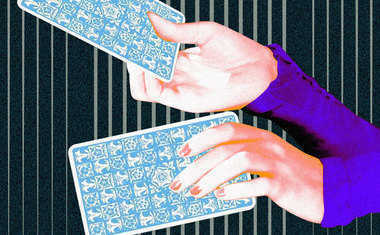 A born leader, this determined Fire sign has a tendency to act first and think later. Aries LOVES taking on new things, but due to their short attention span, they don’t always finish them. And while their bold nature usually gets results, their self-centered attitude can often create problems in relationships. 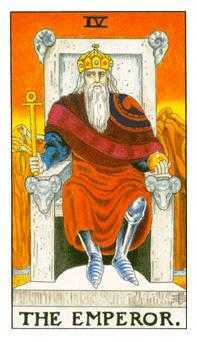 The Emperor card features a wise, authoritative man sitting on a stone throne embellished with Rams! His white beard represents experience, while his armor is a sign of the inevitable battle to come. Like Aries, the Emperor reminds us that, "Anything worth having is worth fighting for!" 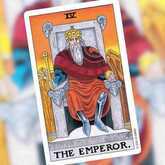 The ball in the Emperor’s right hand represents the world, or more specifically his role as the ruler of people. The red robe and vibrant sunrise support the theme of Fire. Aries is also ruled by Mars, the red planet. The color red inspires initiative and taking action! And last but not least, the powerful mountains in the background remind us of the unyielding nature of Aries.